Thanks for venturing into the shop! Here you'll find more information about each album and be able to purchase them through Paypal. We can deliver all over the world and don't worry about the "£" sign, Paypal and your bank will do any currency conversion automatically. When we receive your order we'll email you a link to the included mp3 downloads. Plus, buy all four CD's and we'll send you the DVD for free! Pulling the best tracks from the first 3 albums and some new music Without Words brings shorter, instrumental meditations for your own reflection and mindfulness. Comes in an exclusive hand decorated CD case. We use this CD a lot in various services and events we're involved in. It's perfect as a backdrop to readings, prayers or liturgy. But it's also perfect just for listening enjoyment. Brian McLaren renarked that it was "The best he'd heard all year", which makes us very happy indeed. Introducing the beautiful voice of Hannah-Claire Cameron who collaborated with Robin with both her vocal and writing talents. 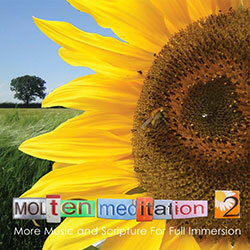 Hannah has continued to be part of Molten Meditation ever since, including Greenbelt performances and Soul Circus projects. Each meditation is between 10-15 minutes long using soft, soothing, uplifting ambient music to relax the soul and ease the mind. The words of scripture are introduced softly within the music, making them easy to absorb and yet leaving space for your own prayer and worship. Written and produced by Robin Vincent and Hannah-Claire Cameron. Many thanks to Matt Parsons for the bass on track 3. And Robin finally got over himself and started using his voice without any disguising. 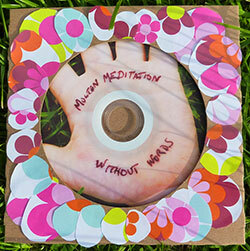 Building on the first album and using what we'd learnt from running meditation worshops at Greenbelt, MM2 has a summery feel and a deep sense of hope. Plug yourself in on the train to work, while riding a bus or taking a stroll. Take a break - 10 minutes of peace. Relax at the end of the day - in the bath - chilling out. Use it as part of your worship. Listen to it in your Cell group as an aid to contemplative prayer. 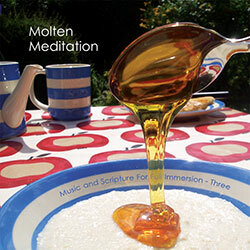 The original Molten Med CD released in June 2006. 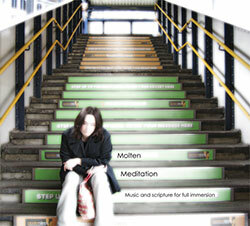 Comes in a beautifully desgined digipak CD case with a full colour artwork for each meditation. Finding a time and place to meditate and reflect on God's Word can be a struggle. So many distractions, so many interuptions. If you do find a moment of quiet all you can hear is the chatter of your own mind trying to contain the day. Molten Meditation wants to help. Each meditation is between 10 and 15 minutes long during which the world is pushed away and replaced with soothing and uplifting music. The words of scripture are introduced softly within the music, making them easy to absorb and leaving plenty of space for your own worship. Written and produced by Robin Vincent. Little known fact - Robin disguised his voice in the first two albums by raising the pitch, partly because he was embarressed and partly because he didn't want to hear his own voice when using the meditations himself. 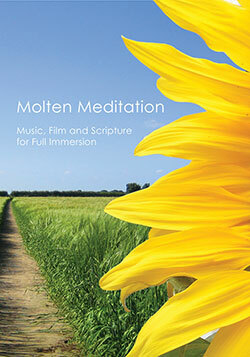 Our first DVD, released in 2008, containing five meditations and accompanying visuals taken from the first two CD's. The visuals add another dimension to the meditations. Comments we've had back from events suggest that many people find them helpful and others find them a distraction. We feel that a visual focus can be helpful, although closing your eyes and immersing in just the sound is perhaps a more intense experience.